Hockey Mom has so much sparkle, the opposing team will need sunglasses. What Mom doesn't like to support her hockey player? 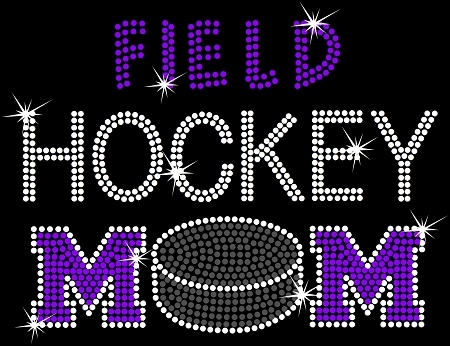 Our bling hockey Mom shirts can be custom designed to support your favorite player. Optional updates include adding town or mascot name or even field for the those field hockey players, personalized the shirt back in uniform style and adding your player number in mega bling. 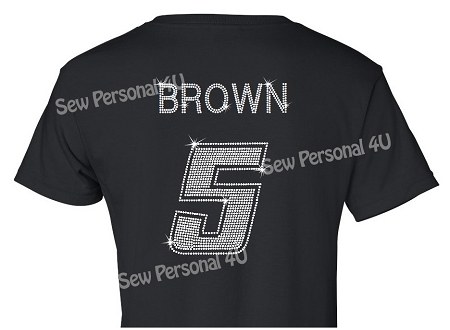 Make it your own and support your team with BLING! re Bling shirts that are not rhinestones. They sparkle just like real rhinestones, but are made of a sequin material that is soft to the touch. No worries about rhinestones falling off of a shirt, and our bling material is easy to clean, turn shirt inside out and machine wash - dryer safe.